Fresh roasted coffee is never more than a few steps away with the Zenroast. 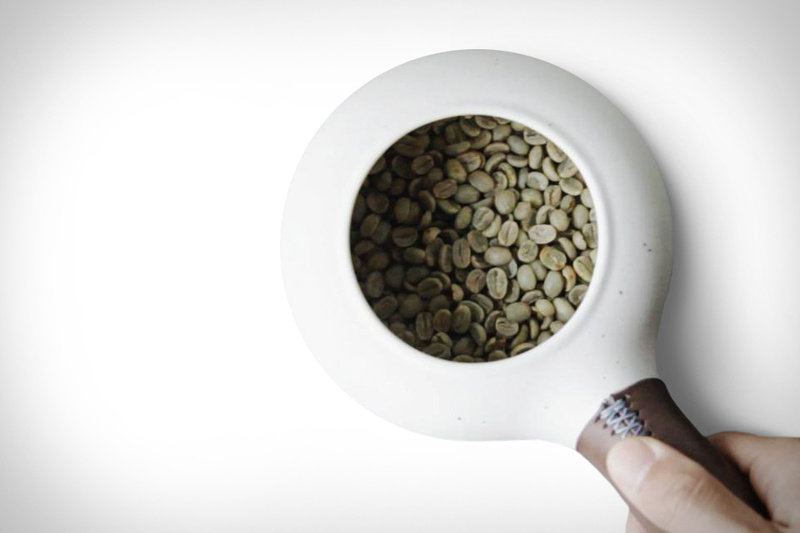 Traditionally used for roasting tea leaves and sesame seeds in Japan, this primitive tool has been redesigned for your fancy-schmancy coffee beans. Just pour your beans in the Horoku and put the Zenroast over an open flame. In a few minutes, you'll be grinding up your own special roast. Hand-crafted in one of the six ancient kilns of Japan, the minimalist design and leather handle will complement any counter. There's a million reasons not to cook dinner but the Tovala Smart Oven eliminates every one of them. The multi-function oven bakes, broils, steams and convection heats to ensure your dinner is ready in under 30 minutes, while the Wi-Fi enabled automation makes cooking a restaurant-quality meal as easy as scanning a barcode and pressing start. Allow master chefs to do all the prepping and cooking for you with weekly menus that cover paleo, gluten-free, vegetarian, vegan, low-carb, keto, and low-sugar diets delivered right to your doorstep, eliminating cleanup completely. And with prices ranging from as little as $10 to $15 per meal, take out has never been less tempting. There's little question that using with real butter is healthier than some spray from the store. It can also be a hassle. The Biem Butter Sprayer makes it easy. Its intelligent design stores an entire stick of butter in its body, melting only the butter you need at a burn-free 95 degrees and delivering it through a clog-free nozzle using nothing but heat and air. It's also great for buttering toast, veggies, and popcorn, automatically turns itself on and off thanks to an accelerometer, and has a stylish design with a silicone front and brushed stainless back that looks great whether you keep it in the fridge or leave it out on the counter. There are plenty of ways to brew a cup of coffee, but few that are as visibly pleasing and versatile as the Trinity One Coffee Brewer. Ideal for specialty coffees, the Trinity One is made using stainless steel and a beautiful walnut timber finish. You can brew using the pour over method, air pressure using a weighted cylinder, or cold brew. It will reduce kitchen top clutter and look great in the process. Lets face it, the more opportunities to eat pizza you have, the better. And the Stovetop Pizza Oven from Pizzacraft should provide plenty of new opportunities. Dual cordierite stones are used to absorb the heat from your gas range and redistribute it evenly. It also comes equipped with a built-in thermometer that lets you know when it's ready to cook and a moisture vent on top to keep the pie crisp. Cook at temps that get up to 600°F and make better pizza at home than you can get from the delivery guy. Brewing regular coffee and tossing it over some cubes is no way to make an iced coffee — it's just a good way to make a watered down mess. The Hyperchiller Iced Coffee Maker lets you make cool, refreshing drinks with zero dilution. Thanks to a multi-chamber design, the ice and coffee never come into contact with one another, letting you cool your coffee by as much as 130 degrees in a single minute. Just brew, chill, and enjoy. With the ability to fit into a normal wall oven cavity and an interior ventilation system that requires no extra construction, the GE Monogram Pizza Oven is the closest you can get to a pizzeria in your kitchen. The stainless steel exterior fits right in with your other appliances, and while it still takes a while to preheat, once it's ready it can cook any type of pie you want in just two minutes. Precise heating and app control keep the temperature exactly where it's supposed to be, resulting in evenly-cooked, outstanding pizza.